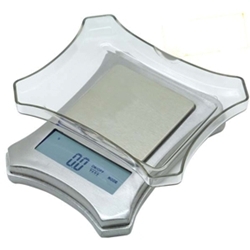 The "Glacier" digital pocket scale manufactured by US Balance offers the highest accuracy of any digital scales in our line. The Glacier features a bright blue backlight, all metal silver casing, and a digital touch screen - making the Glacier the most high tech unit from US Balance. Ready to use out of the box. With its 0.01 gram sensitivity the Glacier provides a maximum accuracy scale at top value! - Overall Size: 4.3" x 3.3" x 0.8"